After 10 hours of flying, 12 hours of train-riding and a few days spent in Budapest, Zsolt and I have finally arrived in the beautiful Pecs. So be prepared, because the next little while on Bumpyboobs is basically guaranteed to be adventures in Hungary-land (i.e. Magyorszag if you want to say that in Hungarian). Catherine and Zsolt’s totally awesome adventures of getting SICK!! We’ve never been sick at the same time before, and I have to admit, we handled it rather differently. Zsolt was cheery as anything. I was full of WTF!! anger, at least on the first day when I felt like a heavily congested achy grumpy zombie lady. I ought not to go into specifics. . . but I will just a little. Ever since chemotherapy (I don’t like how often that line reappears in my stories), I’ve been avoiding getting sick. My mantra is “Happy, Healthy and Cancer-Free.” Though lately I try and remove cancer from the equation entirely, and just say, “Healthy & Happy.” Therefore, this means keeping a minimum two or three meter distance from sick people – and running away as soon as possible, not touching anyone who is sick, not using the same cutlery or food, and just NOT getting sick. Because sick reminds me of being sick. And I never want to be that sick again. So I was rather pissed when I caught this cold. But it’s only a cold, and I was being stupid. However, no matter how logical my brain was in saying that, my emotions were throwing me all over the place and were desperate to lay blame, and simply not-feel-this-way-anymore. Zsolt, meanwhile, was sipping his tea and wearing his comfortable clothes, and enjoying this little reprieve from the business of life. He says to me, “We’re sick at the same time!” like it’s cause for celebration. So I decided to try and lighten up. These stupid colds are going to happen in life. And when I’m a mother, I reckon it may become inevitable. Holding so much deep rooted anger toward illness isn’t going to do me or my body any favours. It’s my personal take-away: I need to address this source of anger. But in the meanwhile, we’ve been eating meat soup, which is really chicken soup. Oh my God it is delicious. Zsolt’s mom puts all kinds of vegetables into the broth (e.g. carrots, radishes, broccoli, potato, brussels sprouts, turnips, garlic, onions, etc.) along with the chicken, and then she strains everything out so what’s left is this golden tasty broth that might of well have descended from heaven. This has been our medicine for the past three days, and it’s basically all I’ve eaten (chicken and veg bits thrown in). 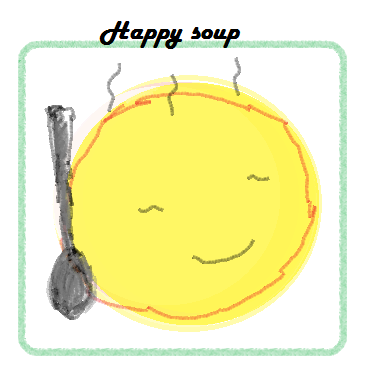 I’ll tell you what, when the body is feeling down, there’s nothing better than chicken soup. Actually, yes there is! Chicken soup that I didn’t need to make for myself. Add some paprika potato chips to that arrangement and you’ve achieved perfection. Anyhow, this is really just the first adventure. And while it might not be a typical travel-log experience, it was actually quite revealing for me. I still have no interest in voluntarily getting sick, or ever getting sick, but it would be good not to get so angry about life’s small & inconsequential bumps. It is chive season in Hungary at the moment. People are allowed to pick the chives (cut the chives?) from the forest since it grows there all over. However, each citizen is restricted to 2kg of chives. Almost there 🙂 Thanks, Marie. I was smiling when I read those words, even before I got to the end of your sentence. Yes, exactly! I had the impression that men were worse at being sick – but I was a total wimp this week. I guess when you go through something so huge, it changes how we react. Thanks for letting me know I’m not alone in that, Mandi. awww, what a sweet guy your zsolt is! and what a fab mama-in-law to make that mouth-watering soup. with the backdrop of both being so attentive, i’m so glad that you have been able to find a perspective on being “sick” that helps you. you, and every one of us who have gone through a cancer experience, have every reason to feel powerful emotions when we don’t feel well – even if it’s only a cold. i have been super paranoid about being exposed to other people’s germs – doesn’t matter if they are next to me or 50 feet away, i hold my breath and high-tail it outta there! Catherine, I too avoid sick people. I hold my breath until I get past a person who is coughing! Reading your post got me thinking: Is there a connection between Hungary (and its celebration of food) and the word hungry? I can understand intolerance toward sicknesses. After chemo, many of us have exhausted our quota of sick days and refuse to pay for any more time off! As for you and your husband getting sick at the same time, it’s sort of like a two-fer.